This elegant expression of Unangax^ clothing design is based on the European-style greatcoat, but made of feather-light sea mammal intestine instead of heavy wool. 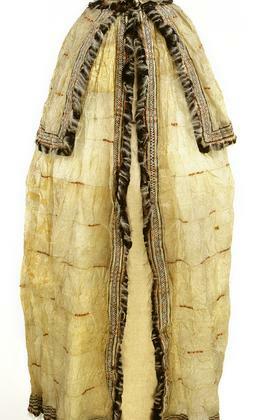 Seal esophagus appliqué, caribou hair embroidery, colored yarn, cormorant feathers, and human hair add to its beauty. Vlass Shabolin: What a beauty! Mary Bourdukofsky: And trimmed with feather. Mary Bourdukofsky: I think I’ve seen it in a book I have. These were the ceremonial capes. When they were celebrating, I think they used to wear these kind of capes. Aron Crowell: What is the Unangax^ name for this type of cape? Daria Dirks: This is a Russian style? Mary Bourdukofsky: Yes, it looks like the style came from Russia. Maria Turnpaugh: The Aleuts didn’t have shawls. Mary Bourdukofsky: It’s very wide animal intestine. Aron Crowell: What kind of intestine is this? It’s so much bigger than the sea lion. Mary Bourdukofsky: Yes, ugruk [Iñupiaq word for bearded seal] maybe. Maria Turnpaugh: Very thin too. I don’t really know. Aron Crowell: What about those feathers? Is that cormorant? Mary Bourdukofsky: Cormorant will always be black. This has light brown in it. Maria Turnpaugh: It’s different shades of brown. Aron Crowell: And then it has the white feathers too, down of some kind? Daria Dirks: This has a little bit of green feathers in it [at neck]. Aron Crowell: There’s some fine white hairs that are worked in to the seams too. Mary Bourdukofsky: They used quite a bit of that. The sewing is just so fine! Mary Bourdukofsky: Like a queen or a king. Aron Crowell: Did chiefs have any special clothing? Mary Bourdukofsky: Maybe for ceremonial dances. On certain holidays maybe they dressed up in their best regalia, sort of like this. Maria Turnpaugh: Yes, that was before my time. Mary Bourdukofsky: Yes, before our time, that’s what I’m’ thinking about. Aron Crowell: Is it possible that a parka like this would be made for special visitors to the community? Mary Bourdukofsky: I doubt it, unless they were for the priests. Maria Turnpaugh: This could be a priest’s cape too, who knows. Aron Crowell: I do know that these were given to some sea captains who visited Aleutian Island communities. Mary Bourdukofsky: They used to like to trade, and it could have been given to a sea captain. Aron Crowell: Could we talk for just a minute about chiefs and the way some families would be more important—both the way things were before the Russians came and then afterwards. Maria Turnpaugh: Well my great-grandfather was the last Aleut chief. He was the main chief of the islands. Each island had their own chief, and if they had any problems, they’d come to him for advice. He’s in history books too. Aron Crowell: What was his name? Maria Turnpaugh: Alexei Yachminoff. He arranged a lot of marriages—like a widow with children and he’d find a husband for her. He just took care of everything in the village. For the eastern Aleutians, he was the main one because from the different villages they’d come to see him and ask him advice if they were having a problem they couldn’t solve. He was very respected, not only in our culture, but the Caucasian population at home. He worked with a lot of them. They’d come to advice for him about a lot of things. He gave all kinds of advice, and people listened to him. They really respected him. It’s something you don’t see anymore is respect like they had then. 1. According to Mary Bourdukofsky and Vlass Shabolin, shaulong^ [shawl/cape] comes from a Russian word, and this garment is also called an indalux^ [cape]. The U.S. Exploring Expedition under commander Charles Wilkes collected this fine cape, made in the style of a European greatcoat, in about 1840. (3) It is made of sea mammal intestines, with tufts of hair and red and green wool worked into the seams. The cuffs, collar, and border are decorated with bands of dyed esophagus, caribou hair stitching, and cormorant feathers.